All goddesses LOVE Moroccan susti! This luxurious fabric is an impossibly soft natural cotton/rayon blend that's truly the cashmere of cottons. It's hand woven and dyed in the exotic and ancient city of Fez, and here at Tiendaholics you'll find hundreds of styles that we call the y-u-m-m-i-e-s-t clothes on the planet! Warning: Once you feel this scrumptious, breathable organic fabric, you won't stop until your closet is FILLED with it! 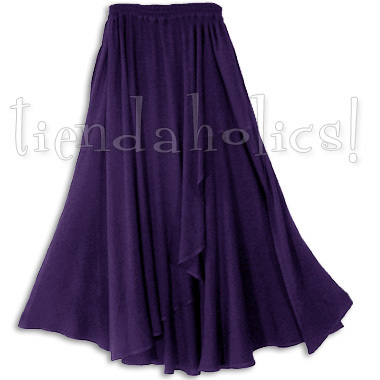 This skirt is a belly dancer's dream, or for every woman who dreams of being one! This wild fluttery gypsy skirt is nothing short of sensational! It's similar to the Malak style in its layers of dreamy susti, but this one, the SHALÂL—"waterfall" in Arabic—has a full skirt as its base and two long, cascading drapes that you can style so many different ways! These pieces begin at the waist and fall in HEAVENLY individual flutters that offer the appeal of an asymmetrical handkerchief hem! And of course, it has a flattering wide elastic waist, stitched in three rows for comfort and stability, and handy side pockets... It's funky and feminine and 100% unique—neither my words nor my photos can convey how OMIGOD gorgeous this is!